Product #760 | SKU 8060-040-110 | 0.0 (no ratings yet) Thanks for your rating! Runs on rechargeable or alkaline C batteries, offers up to 803 lumens output, has a maximum runtime of 69 hours. Introducing the all new full size, full power and self-programmable 8060 LED. Packed with the most advanced technology found in any duty light on the market. 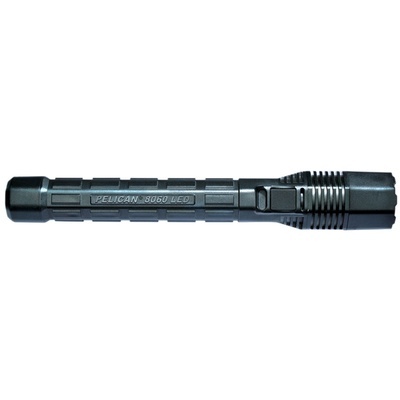 Powered by a rechargeable NiMH battery pack or 4C cells, the Pelican 8060 Rechargeable Tactical Flashlight (Black) is the longest running duty light today. Full size equals full performance and, at almost 32 cm in length, you can be sure that your 8060 will deliver in any emergency. With over 800 lumens available at your fingertips and up to 69 hours of useful light will ensure that your light will keep burning even when all hell breaks loose.